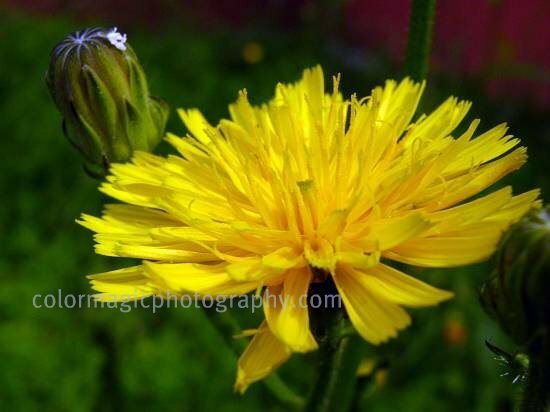 Welcome everyone to Macro Flowers Saturday 73! I have just some modest yellow wildflowers for today. They grow in large colonies and are very similar to dandelion flowers. Narrowleaf Hawksbeard-Crepis tectorum by its name, is an invasive species of weed, spreading very fast on wastelands and roadsides but bees like them very much . 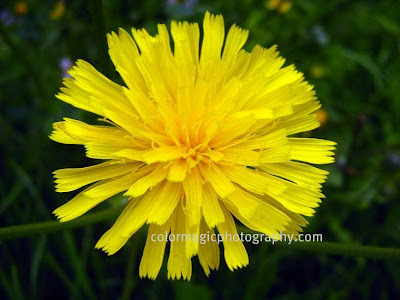 Join the list and share your beautiful flowers with us! I love the yellow, almost a theme today, and if the bees love them? Gorgeous shots. They look so delicate. 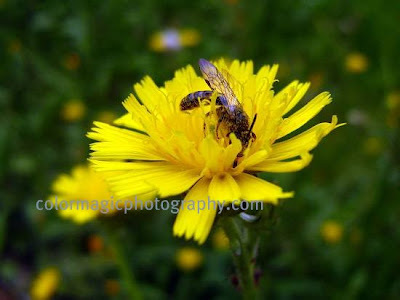 Maia, that was a great shot of such a beautiful delicate flower and bee! Sunny and happy colors! Maia, I love the pretty toothed edges of the petals. Lovely. Too bad this beautiful little flower is an invasive species. But then if the bees like them they can't be all bad. Great shots Maia! I've not seen this flower before Maia. Beautiful yellow color. That's a sassy yellow flower you have there. Nice shots. Beautiful yellow blooms. Very nice macro shots. I love the crisp clarity of the flowers and the composition! Maia, thank you for leaving such a poetic comment on my photo. I really love this: "Yes, you are right, natural light is the soul of photography. Your cosmos flowers are laughing in the sunshine." Thank you! I very well remember my words Sara and I don't understand the sense of quoting it here. Is there anything wrong with being poetic? Unfortunately, I don't master English as well as I would like to but I could pick up some idioms, if needed. What I will remember is that you left thousand of people with dead links, all over their posts but that doesn't seam to be important for you. Of course, I know that you are innocent and have no idea what that means but that just doesn't correct things. Thanks for the reminder. I usually do, but yet another senior moment got me. I'm now linked.